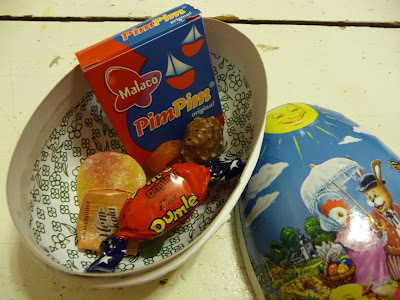 My friends came to visit last week from Sweden, and they brought a cheery Easter gift for me: a decorative paper egg box filled with a selection of their favorite childhood Swedish candies. We had a lot of fun munching on sweets. They shared their candy related childhood memories, and I tried their Swedish treats for the first time. Then, on Friday while meandering down Bleecker Street, we saw a sparkling white Swedish candy store and we stopped to inspect the goodies. The shop is called Sockerbit and has a huge array of imported Swedish candies, including some of the same ones my friends had given me, and the very same Easter egg boxes. It was a double whamy: first my friends' handpicked gift, and then a store right here in NYC where I can continue to indulge in brightly colored gummy pacifiers, tiny boxes of candy, and salted licorice. The daily mission of The Occasionist is to make every moment count. Creative, quirky, elegant and casual inspirations for all occasions.